Do you guys mean TM2 or "Transmetal 2 Megatron?" I don't think there's a "Transmetal 3" anything in Beast Wars. Wolfman Jake wrote: Do you guys mean TM2 or "Transmetal 2 Megatron?" I don't think there's a "Transmetal 3" anything in Beast Wars. So, did BotCon just name that "Transmetal 3?" I figured it was supposed to be his Transmental 2 form from the show and toyline. Is it "3" now just because the mold is a six changer? I don't think it's ever been officially called a Transmetal 3 but that term is as good as any to describe it, even if it's a bit inaccurate. Edit: Anyway, sorry I dragged this off topic. 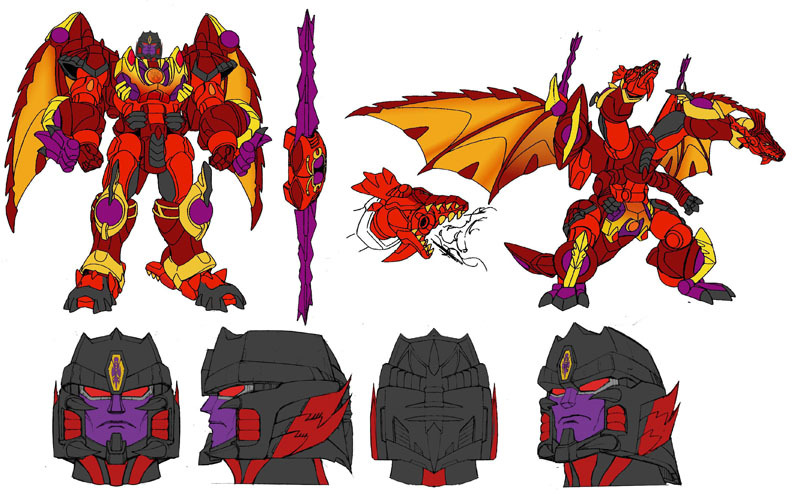 Unless, somehow, it end up returning on topic if a War for Cybertron Deathsaurus pre-tool end up announced and it's a Dragon Megatron. Which I doubt, but would it be cool? Hell yes, it would. If we are keeping it to G1, my number one would be Omega Supreme. Then an Ultra Magnus that has a Prime cab that transforms to a white prime then puts on the trailer to get his Magnus look. Next would be "Soundwave Lamppost." 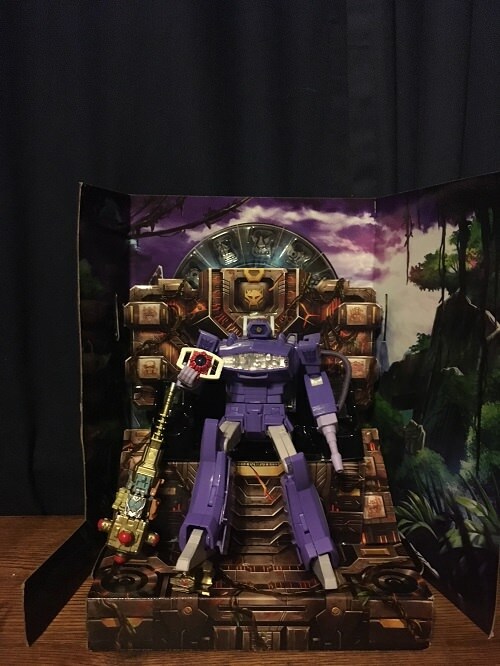 My last want would be an Ark playset that opens up and had mini figures of a bunch of the Autobots and Decepticons, or maybe even big enough to fit legends in there. And it better have Teletraan 1 voice clips too. Well, Omega Supreme seem like he's more of a 'when' than an 'if' I suppose. 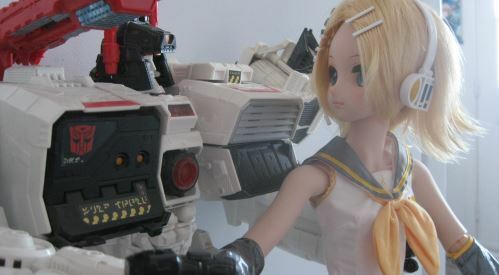 Skritz wrote: Well, Omega Supreme seem like he's more of a 'when' than an 'if' I suppose. The ONE Omega Supreme that we will NEVER get: Animated. Damn, shut up and take my money! The latter. Fully scratch-built. Only one or two total were ever made. Damn, amazing! Too bad no 3P companies ever picked it up. Oh well, maybe a full Cybertronian Omega could be a thing? I'd like an affordable one made by instead of the ridiculously expensive Planet X. That animated omega supreme is a thing of beauty. 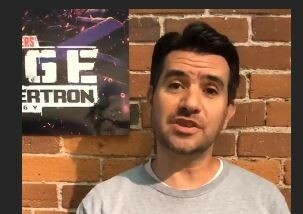 Also in some more San Diego Comic Con 2018 news, we have a short clip from the official Instagram account for Hasbro Transformers, featuring brand manager John 'Hasbro' Warden listing off the contents of the Thursday panel with the company - as previously reported in this story here. 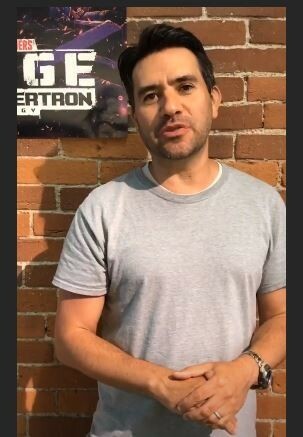 The added piece of speculative news is that Warden is talking in front of a banner that seems to contain the War for Cybertron new logo and graphics, including a first line ending in -GE (as well as a -GY at the bottom, probably standing for 'trilogy'). Take a look below for yourselves, and speculate away in the Energon Pub as to what -ge ending word this first part of the new series might be: Siege? Rage? anything else entirely? Let us know, and stay tuned for our coverage of the event later this month! Scrounge of Cybertron. The rise of it's greatest hero and his special arm. Carnivius_Prime wrote: Scrounge of Cybertron. The rise of it's greatest hero and his special arm. I hope, and assume that what this means is that instead of what the original IDW did they are rebooting things post Unicron, and starting with the war on cybertron, with an accompanying toyline. Agent 53 wrote: I hope, and assume that what this means is that instead of what the original IDW did they are rebooting things post Unicron, and starting with the war on cybertron, with an accompanying toyline. Speaking of which, I wonder how many WFC/FOC reissues we would get? Either as part of the main line, or as something-or-other exclusives? My guess is probably around zero? Yeah they've gone out of the way to say it's got no connection to the games and I would bet that idw reboot is going to be sharing a lot in common with this setting and toy designs. ZeroWolf wrote: Yeah they've gone out of the way to say it's got no connection to the games and I would bet that idw reboot is going to be sharing a lot in common with this setting and toy designs. I'll probably jump back on with War For Cybertron. I skipped the whole Combiner\Titans\Prime trilogy. I started to quite quickly feel like I was getting characters I wanted, but with gimmicks I really didn't, so I stayed clear. Certainly would be cool to have stuff focusing on the start of the war. Shame they ended up releasing the first G1 Sentinel Prime toy during Titans Return as releasing him during a line with such a theme (if it is true) could have been a good way to build some hype.